You gotta give it to Wye Oak, when they do a homecoming show, they do it in style. Playing at the completely sold out Ottobar Saturday, Jenn Wasner and Andy Stack ended what can be considered a remarkable year by anyone’s standards in the warm (really warm) embrace of their hometown fans. This is the third time we’ve talked about the band this year, and so there’s really not that much more to say. You already know how the band began 2011 by releasing their latest album Civilian to widespread acclaim. You already know that they showcased those songs along with fellow Charm City musicians Lower Dens at The Black Cat for an NPR broadcast. You already know that the band has already had one homecoming show this year in throwing a pseudo release party at Baltimore’s 2640 Space, and abandoned church that has been converted into a performance venue for just such occasions. And all of that was before things got really crazy. It would seem that the rest of the world has finally discovered our little hometown band. The potential was there a few years ago for this duo to take over the world with their music, and it would seem that 2011 is the year that that potential was realized. Whether it was touring the US nonstop in support of Civilian, recording not one but TWO songs for the A.V. Undercover series(Danzig’s “Mother” no less), or finding themselves opening for The National as they close out their year of awesome, it would seem that Wye Oak have, put simply, f@#ing arrived. And nowhere was that more clear than Saturday night. To be clear, this was the last show that the band will play this year, and probably for a while. As such it was a loose affair despite the packed in sweat lodge that Ottobar was transformed into. Openers Pattern Is Movement were there to warm up the crowd but in the end it was all about Jenn and Andy. Near the end of their set, Movement singer Andrew Thiboldeaux brought out Wasner to duet on a seemingly untoppable rendition of Janet Jackson’s “I Get Lonely”, only to bring Andy Stack out for, honest to god, a SAX solo on their take of D’angelo’s 2000 hit, “Untitled (How Does It Feel)”. Let the party begin. After a short break, Wye Oak took the stage and one thing was immediately clear: They have become a far better band then they were at the beginning of the year. Apparent tour exhaustion and a seemingly overwhelming gratitude just to be home kept the energy level of the show well below that of the previous 2011 shows in the area, but it was barely missed. 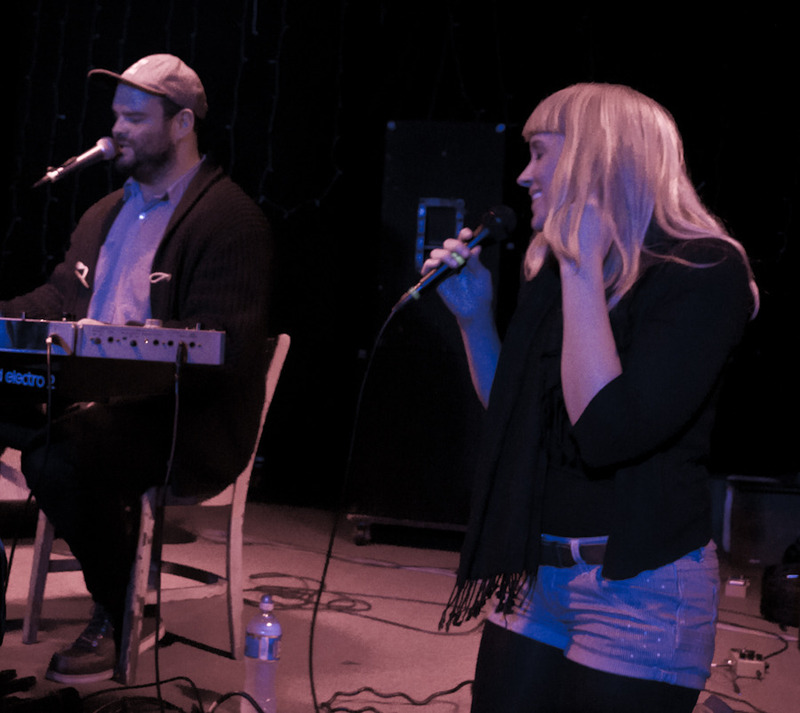 In it’s place was newly found richness of sound, an undiscovered depth, that made the evening as much as a celebration of where the band has come from as it did point the way to where Wye Oak is headed in the future. Leaving no album untouched, the band tore through all of the best parts of Civillian, (practically pulling all of the air out of the room with that albums title track) and wound their way back through 2009’s The Knot, and 2008’s If Children, easily updating these older tracks to their newer more refined sound. By the end of the set there was the exact feeling that this was a goodbye of sorts. A clearing out the closets for whatever is to come for Wye Oak in 2012 and beyond. Ending their set with a cover of the Kink’s “Strangers” and it’s refrain of “We are not two. We are one”, Wasner and Stack thanked the audience, and then quickly left the stage, calling their fantastic year to a close. In a show full of walls of feedback, crippling emotions and dancing Santas (the group performed the Baltimore club song “Dance My Pain Away” complete with a dancing Jimmy “Santa” MacMillian of The Soundgarden Records fame) it was this sentiment that resonated the most. Whether it was in reference to the relationship they feel with the audience or simply a declaration of their unity as a band, or both, what was clear is that this is just the beginning for Wye Oak and they know it. So for now it would seem that Wasner and Stack are going to retreat back to the streets of Baltimore that they call home and get some much deserved rest. When they reappear is anyones guess, but rest assured that they definitely will (at least according to Wasner’s comments throughout the night) and at least for us their return can’t come soon enough. Older PostLET THERE BE ROCK!!! Win 2 tix to see Drive-By Truckers at the 9:30 Club on 12/30!! !